Camp 1: July 16th and 17th - 9 a.m. to noon or Camp 2: August 13th and 14th - 9 a.m. to noon. You can sign up for one of the camps or both of the camps. The camps are 2-day camps $40. 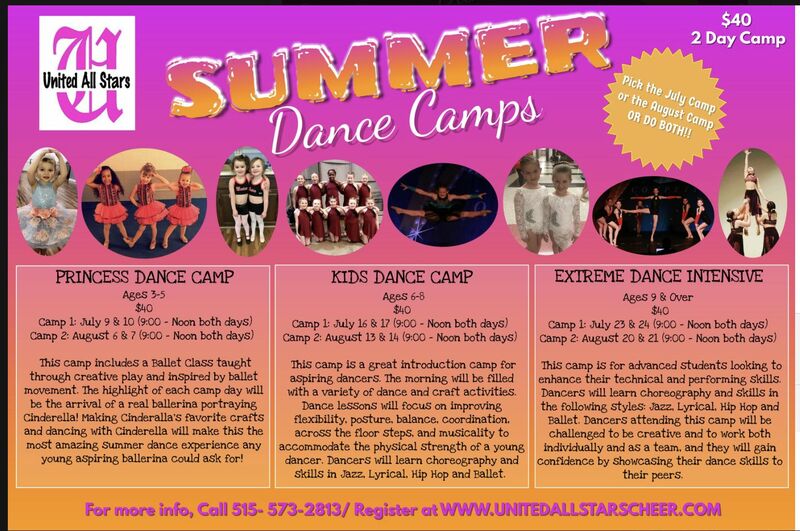 This camp is a great introduction camp for aspiring dancers. The morning will be filled with a variety of dance and craft activities. Dance lessons will focus on improving flexibility, posture, balance and coordination, across the floor steps and musicality to accommodate the physical strength of a young dancer. Dancers will learn choreography and skills in jazz, lyrical, Hip Hop and ballet.